The Broad Spectrum Multi Purpose Antiseptic Ointment. 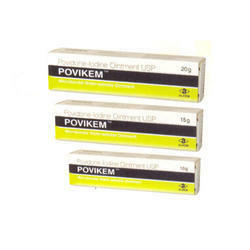 We manufacture Povidone Iodine Ointment. - Treating minor wounds and infections, as well as killing bacteria. - Povidone/iodine cream is an antiseptic combination. It works by killing sensitive bacteria. Owing to our in-depth industry experience and precise knowledge of this domain, we are trading an outstanding assortment of Povidone Iodine Ointments. used as an antiseptic in cuts, abrasions, burns, grazes. We offer Povidone Iodine Solution I.P. (10% w/v) to our valued clients. These are manufactured using best quality ingredients as Co-altar oils, acids & phenolic compounds in compliance with IP, USP and BP standards. These are used as antiseptic solution for greasing and cleansing of patient's body and surgeon's operating team's hands. Our range can be used as broad-spectrum. 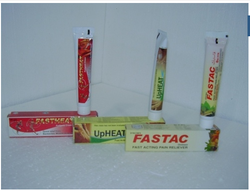 Water Soluble Ointment Base Q. S.
Usage :- Topical Anti- Infective, Anti- Septic & Anti- Bacterial.